When my father died last year, I began his eulogy by noting that another oak had fallen. 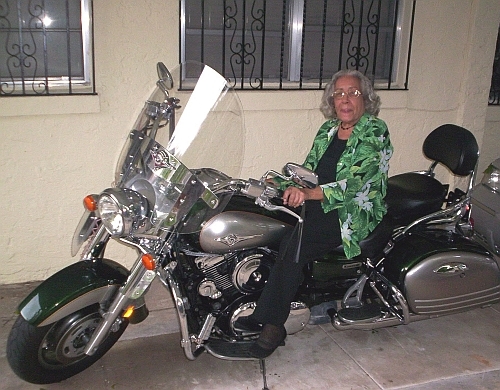 This morning, around 1:25AM, Ana Olivia Cruzata Marrero de Campello, his wife of over 60 years, and my beloved mother, passed on on the day of her 97th birthday. If my father was an oak, then my mother was an equally strong, but also very pliable, and elegant tree. When hurricanes attack the mainlands of the world, the strong tall trees often fall, but the pliable ones, like plantain trees, always give with the wind, and survive the storms, and thrive in the drenching rains. My mother was like a an aged plantain tree, not only immensely strong and pliable, but also giving and nurturing. Like many Cuban women of her generation and her social-economic background, she had never worked for a living in Cuba, and yet within a few days of our arrival in New York in the 1960s, she was working long hours in a sewing factory, putting her formidable seamstress skills, honed in the social sewing and embroidery gathering of young Cuban girls, to use in the "piece work" process of the New York sewing factories. As soon as we saved the money, one of the first things that my mother bought was an electric sewing machine - a novelty to her, as she had always used one of the those ancient Singer machines with a foot pedal. I remember as a child in Brooklyn, that women used to bring her fabric and a page from a magazine with a woman wearing a dress. Without the benefit of a sewing pattern, my mother would whip up a copy of the dress that was more often than not probably better made than the original. As the word of her skills spread, so did her customers and soon she was making more money working at home than at the factory - but she kept both jobs. I once noted to her that I admired the courage that it must have taken her to leave her family and immigrate to the United States. "We didn't come here as immigrants," she corrected me. "We came as political refugees, and I initially thought that we'd be back in Cuba within a few years at the most." When the brutal Castro dictatorship refused to loosen its stranglehold on her birth place, she became an immigrant, and from there on an American citizen from her white-streaked hair down to her heel bone (that's a Cuban saying). Like my father, she loved her adopted country with a ferocity, that I sometimes feel that only people who have been bloodied by Communism can feel for a new, free homeland. As as I've noted before, Cubans are archaic immigrants... we love this great nation because we recognize its singular and unique greatness; perhaps it is because our forebears had the same chance at greatness and blew it. I remember as a teenager, once I started going out to parties and things at night on my own (around age 16 or so), that my mother would wait up for me, sitting by the third floor window of our Brooklyn apartment, where she could survey the whole neighborhood and see as far as the elevated LL subway station a few blocks away, to watch me descend the station stairs and trace my way home. My mother was always fit and, as once described by my father, "flaca como un fusil" (as slim as a rifle). She was strong and fast. She was also quiet, but never silenced, and when needed, could and would command attention. My mother was always well dressed and superbly coiffed. When we'd go to parties and events, women would always ask her where she'd gotten that dress! The answer was always the same: she'd made it! At least once a week, to my father's dismay, and in spite of his demands that my mother stop it, she'd get her hair done at the nearby peluqueria (hair dresser). My dad knew, and respected his limits with my mother. I remember one time that my father and I were returning from shopping at the supermarket, dragging one of those wheeled folding carts that could carry four full paper grocery bags. It had been snowing, so the Brooklyn streets were wet and muddy. When we got to our apartment my father opened the door. He then stood there. "We'll have to wait," he said gloomily, "Your mother mopped the floor and it's still wet." This giant, tough, street-brawling Galician then looked at me sheepishly, "I'd rather walk through a mine field than step on your mother's wet floor." I learned a lesson there. She used to delight in telling stories how, as a child, she would often win the horse races that kids staged around the small country towns where she was raised in Oriente province, where her father was a Mayoral. "I almost always won," she'd say, and then would add: "Even though I was a skinny girl." Once, in her seventies, back in the days where you could actually accompany people to the departing gates at airports, we were escorting my oldest daughter Vanessa, who had come to visit, and we were running late. As we got to the airport, we ran to the gate, and to everyone's surprise, Abuela got there first. I still remember how delighted my daughter was that her grandmother could still run like a gazelle. When I joined the Navy at age 17, my first duty station was USS SARATOGA, which at the time was stationed in Mayport in Florida, and thus my parents decided to migrate south to Florida and moved to Miami... just to be close to me. They spent the next 40 years in the same apartment while I was stationed all over the world. 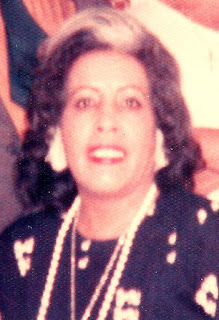 The mostly Cuban-American families that lived over the years in that apartment loved my mother, and would always tell me stories about my mother, ever the nurturer, bringing them food when she knew that they were going over tough times, or riding the buses with them, just to show them the routes. This week, when I arrived in Miami, already somewhat knowing that this was approaching the end, I saw her with tubes coming out of her mouth and her eyes closed. When I spoke to her she opened her eyes, and in spite of the visuals that my eyes were seeing she somehow still managed to look strong. I showed her photos and movies of her grand children, and talked to her for a long time. I thanked her for having the courage to leave her motherland and afford me the opportunity to grow as an American. When she was being extubated, a young woman came into the room with a guitar and played and sang the haunting free prose of Guajira Guantanamera (The peasant girl from Guantanamo); a most fitting song, since my mother was from Guantanamo, and she came from strong Cuban peasant stock. "Guajira pero fina (A peasant, but a very refined woman)", noted a neighbor and loving caretaker. I want to, when I die, without my motherland, but without a master, to have on my tomb a bunch of flowers and a flag. She died without a master, a strong and pliable woman who not only gave me the gift of life, but also the gift of freedom. And as my mother died in her sleep in the early hours of the morning, in the capital city of the bitter Cuban Diaspora, all that I could gather to say to her was mostly the same that I said to my father when he passed last year: "Thank you for your courage... from me, and from my children... and soon from their children. You opened a whole new world for them." I love you Mami... Un Abrazo Fuerte! Thank you for your gifts to me and my children, and happy birthday in Heaven!